Thank you to all who have written to me about my stay this past week in the intensive care unit. Unfortunately, as you may have heard, I came down with pneumonia. Truth be told, it was pretty serious, and other complications arose. But then, five days later, I was still alive — thanks to a combination of Directors Guild insurance, two I-V drips of alleged legal drugs, and a hospital TV that only got FOX News. I was released on my own recognizance, which I tried to explain may not be the best idea. I am now at home resting and binging on the Real Housewives of The Walking Dead. All my appearances this week and last week supporting the release of my brand new movie, “Where To Invade Next” (Conan, Bill Maher, Charlie Rose, NPR, etc. ), plus a special primary eve screening tonight in New Hampshire, were and are cancelled. Needless to say, I’m pretty devastated. This film means a lot to me. To be sidelined – I can’t fly, I can’t travel, I can’t leave the house – in this, the most important week before it comes out… well, you can imagine what I’m going through. Trying to get back to just breathing is enough of a burden. To think that my film may now not reach the audience I made it for, let’s just say that doesn’t help the healing process. Many of you have asked if there’s anything you can do to help me. I have thought about it – and, yes, actually, there is something you could do to help me. I need you to be part of a quickly cobbled-together “army” of grassroots “ambassadors” who can do the work I was going to do this week to let people know abut the movie and convince as many as possible to go see it. I realize you haven’t seen “Where To Invade Next”, so I’m asking you to do this based upon my past work and your hope that I’ve made a compelling film that might affect change in this country, that will inspire people to think about things in a different way. I believe that’s exactly what I’ve done, and many who’ve seen it agree (LINK). I also believe this movie can have a huge impact on the elections this year. It’s won a bunch of film festival prizes, it’s made the Oscars shortlist, and some have called it my best film ever. Possibly, just possibly. But forget all that. Here’s what I will tell you: You are going to be seriously f***ed up by this film. It’s unlike anything I’ve ever done. It will truly make your head spin for two hours while you “laugh AND cry — in the same exact moment,” as an audience member said to the cameras on the way out of the movie’s premiere. Last week, laying in the hospital, I watched one Presidential candidate attack the candidate from Vermont for his ideas being “unrealistic,” “pie in the sky,” and “ideas that sound good on paper, but aren’t going to happen.” The truth is, all these great “ideas” – free universal health care, free university, free day care, taxing and policing hedge fund millionaires – have already happened in nearly every other industrialized country in the world! And I have the evidence – and the film — to prove it! 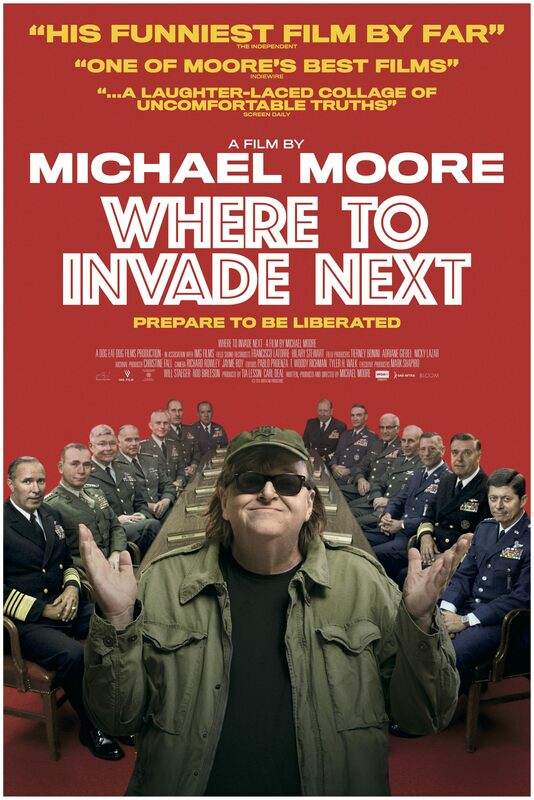 Throughout “Where To Invade Next”, I invade a whole bunch of nefarious countries, from Slovenia to Germany to France to Norway, and pry loose from them the tools they’ve been using to make their countries happy, shiny places. My goal: to show millions of Americans what these countries have been hiding from us so we can catch up and be #1 again! Remember “WE’RE #1!!”? Don’t you miss being #1 and waving those big foam #1 fingers at patriotic rallies? In my invasions, I don’t use any weapons, and no one gets droned. I show how to actually make all universities free (and great); how to give all workers five to eight weeks PAID vacation (which increases productivity and betters the economy); how simple and easy it is to give mothers (or fathers) up to a year of PAID maternity leave (which in turn benefits the company overall); how in the societies where woman have achieved true equality and power, everything just seems to get better for everyone; how to reduce the crime rate by ending the war on drugs and having a humane prison system (our recidivism rate is as high as 80%; theirs is 20%); how the economy bounces back faster and is safer when bankers are put in prison; how students in countries without standardized tests and needless homework perform better than our students (and that countries which have more arts and music in their schools do better in math and science)… and on and on and on. By the end of the movie, you’ll want to go live in one of those countries. But instead, I’ll show you how we can make all of that happen right here in the USA, right now. So, what do you think? 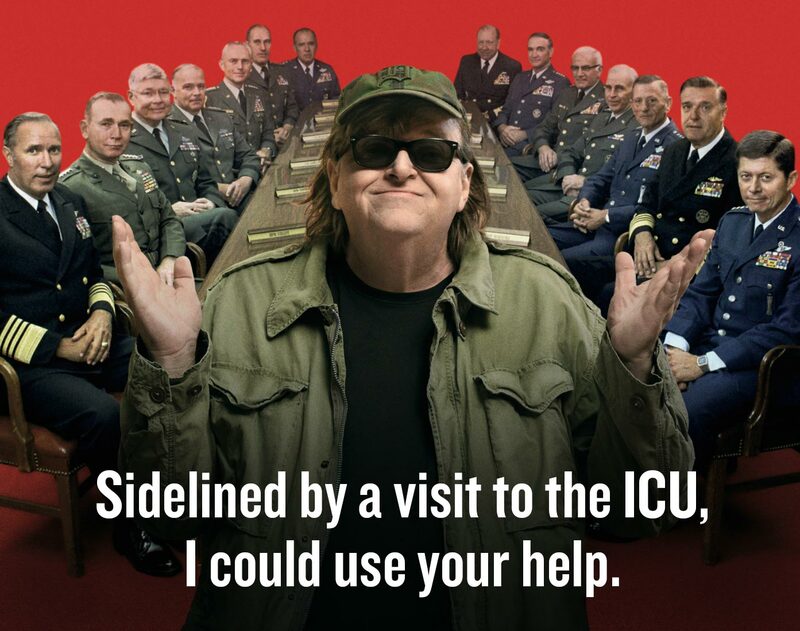 Can you be a virtual ambassador for “Where To Invade Next”? I know you can’t go on “Good Morning America” for me, but there are a few easy things you could do right now from your computer or mobile device. First, go see it! Text some friends right now and say, “hey, let’s go see this Friday night!” Commit now to go to a theater that’s playing it this coming weekend. It’s opening in every major and mini-major city in the country. 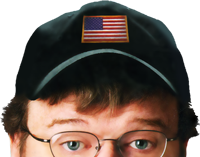 If you live in a place the size of Binghamton, NY, or Grand Rapids, MI, then they’re going to be playing “Where To Invade Next.” The final list of theaters will be out later tomorrow, but here’s a partial one for now (LINK). At the bottom of this letter is the hi-res version of the film’s poster! Feel free to send it around, post it on your social media, download it and print up some flyers, or use it graphically any way that you want. Over the next few days I’ll send you other things you can do, like organizing screening parties for this weekend, sending me photos from your theater that I can post, and sharing with your friends exclusive clips from the film which I’ll send you. If a few thousand of you suddenly became champions and ambassadors for “Where To Invade Next”, then maybe we can pull this off. I certainly would be forever in your debt. Thanks for being there for me.